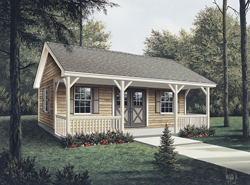 Do-it-yourself building plans include some larger structures such as cabins, cottages, barns, pole buildings, barns and studio home offices among other designs. These building blueprints are easy-to-follow and allow you to build your own structure easily. These building projects are ideal as an addition for your backyard, or for a separate piece of property. Make life easier and build one of these structures for your yard. 312 Sq. Ft., Width 26'-0", Depth 12'-0"
138 Sq. Ft., Width 18'-0", Depth 20'-0"
1128 Sq. Ft., Width 73'-0", Depth 41'-8"
1117 Sq. Ft., Width 62'-0", Depth 50'-6"
217 Sq. Ft., Width 24'-0", Depth 22'-8"
503 Sq. Ft., Width 24'-0", Depth 28'-0"
360 Sq. Ft., Width 28'-0", Depth 20'-0"
360 Sq. Ft., Width 28'-0", Depth 28'-0"
396 Sq. Ft., Width 22'-0", Depth 18'-0"
776 Sq. Ft., Width 40'-0", Depth 26'-0"
Look for more building ideas including indoor do-it-yourself plans, garage blueprints, sheds, deck and gazebo designs, and other backyard shelters for your yard.